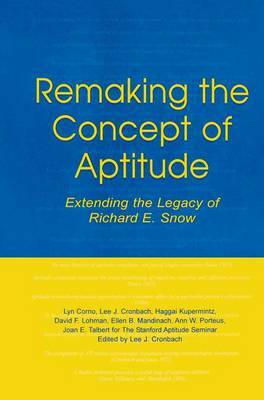 The unique perspective of Richard E. Snow, in recent years one of the most distinguished educational psychologists, integrates psychology of individual differences, cognitive psychology, and motivational psychology. This capstone book pulls together the findings of his own 35 years of research on aptitudes and those from (especially) European scholars, of which he had exceptional knowledge. A panel of experts and former associates completed this book after his death in 1997, expanding his notes on implications of the theory for instructional design and teaching practice. The panel developed Snow's ideas on where the field should go next, emphasizing promising research strategies. *keeps statistical complexities to a minimum, and includes a simply written Appendix that explains the interpretation of key technical concepts. By characterizing sound research in the field, this volume is useful for psychologists and educational researchers. It will also be instructive for teachers seeking to deepen their knowledge of the whole child and for parents of children facing standardized testing.